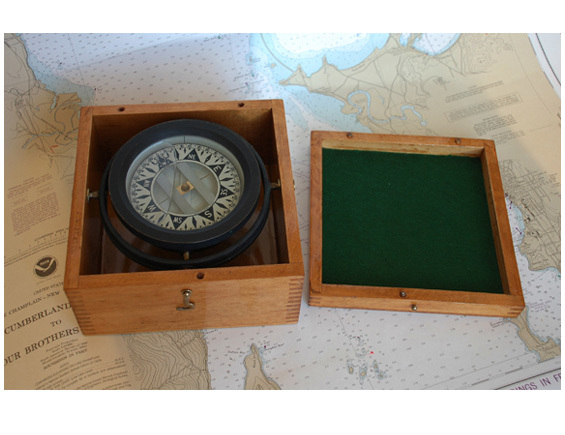 Box compasses were typically used in smaller “open” boats where a regular compass could not be mounted... like lifeboats. This vintage Dringo (originally made in Seattle, Washington) is in excellent condition and is accurate. The box is marked “Gravy Boat”??? The dovetailed box has been refinished... stripped of the old finish, then three coats of hand-rubbed Spar varnish was applied. New felt was installed on the lid. 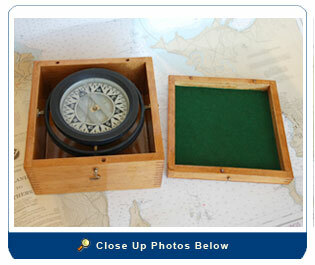 Size: Compass Face: 5 ½”; Box: 8”W X 5”H X 8”D.